Once the all important question has been asked and the bride-to-be has a sparkly new ring on her finger, then what? After you have your engagement ring, it is crucial to take care of it properly so that it remains looking its best beyond the wedding day and for many years to come. Inspect it carefully for any signs of wear or damage, particularly if it is an antique or heirloom ring. Keep the ring properly cleaned so that admirers can appreciate its full beauty. Consider appraising and insuring the ring, especially if it is customized or very financially valuable. Be cautious with the ring to avoid mishaps and accidents that can lead to costly repairs. Finally, show off the ring to proudly announce your impending nuptials! 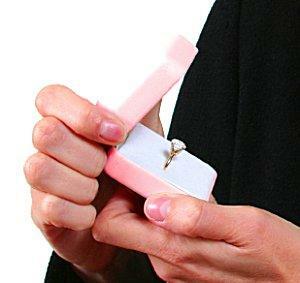 Despite the best intentions, not every prospective groom can accurately predict his bride-to-be's jewelry preferences. The key thing to remember if the ring isn't suitable, however, is not its physical appearance, but the romantic intentions behind it. A ring can always be upgraded or replaced with a more suitable design, but that beautiful, loving gesture should always be cherished and will hold a very special place in both of your hearts.